It is a bit surprising that I have never gotten around to writing a complete guide of Icelandic volcanoes in view of how much I have written about them. Obviously this can’t be a complete write up for all of the volcanoes; instead it will be a list of the volcanoes with a short part written about the current activity, if there is any. Location of almost all of the volcanoes in this guide to Icelandic Volcanism. It lacks Hamarinn, Herdubreid, Kistufell, The Northern Atlantic Volcanoes, Upptyppingar and Vatnafjöll. Image courtesy of the FutureVolc Project. Below I have assigned a risk value for a particular volcano to erupt ranging from 1 to 5. This risk level is of my own device and is based on historical eruption frequency and current level of activity. The risk is purely based on how likely the volcano in question is to erupt in the next ten years, the risk number is not to be viewed as a sign of how dangerous an eruption might be. The risk numbers are percentage based and grouped, so for any particular volcano the number would be anything in between the given numbers. The reader would also be well advised to remember that sometimes a volcano may change its pattern and behavior radically. See these numbers as a handy way of discerning between the volcanic deadbeats and the volcanoes that is likely to blast off soon. Askjas inner and outer caldera in the background and the Viti Crater Lake in the foreground. Wikimedia Commons, photograph by Boaworm. Askja is a central volcano with a nested caldera in the Northern Volcanic Zone (NVZ) with a 190 kilometers and 20 kilometers wide volcanic fissure swarm. It last erupted in 1961 and has produced large VEI-5 or VEI-6 eruptions (Vedde Ash). It varies in eruptive styles from small to large effusive eruptions along the fissure swarm and small to large explosive eruptions. The volcano is seismically active and has suffered both inflation and deflation after its last eruption. It is also hydrothermally active and actively degassing. Brennisteinsfjöll is a NW-trending fissure swarm on the Reykjanes Volcanic Belt (RVB) that is lacking a central volcano. It has a series of crater rows and small shield volcanoes that has erupted 30 times since the last ice age. These eruptions are grouped into series of eruptions called Fires. The last sequence ended with the 1341AD eruption. The volcano is located east of Lake Kleifarvatn. It is tectonically active and suffers from intermittent earthquake swarms and may be activating as a part of a possible reactivation of the Reykjanes Volcanic Belt. Bárðarbunga is one of 3 known central volcanoes on the Veiðivötn fissure swarm. It has produced the largest known Holocene basalt flood on earth, the Þjorsahraun. The volcano is situated just south of the center of the Icelandic Mantleplume and it has been historically highly active. It produces basalt floods, rifting fissure eruptions, shield volcanoes, phreatomagmatic eruptions and explosive eruptions (in the central caldera). The central volcano is situated under the northwestern corner of the Vatnajökull glacier. The volcano is situated where the Mid Icelandic Belt (MIB) inserts into Vatnajökull and the southern part of the Veiðivötn fissure swarm is part of the Eastern Volcanic Zone (EVZ), whereas the northern part of the Veiðivötn fissure swarm belongs to the Northern Volcanic Zone (NVZ). This makes Bárðarbunga into a triple-junction volcano that is intensely seismically active. The last eruption occurred 2014-2015 and it was a medium sized (1 cubic kilometers of lava produced) rifting fissure eruption that occurred at Holuhraun northwest of the central volcano. After the eruptions the volcano has been highly seismically active and is showing signs of re-pressurization in the magma reservoir. The volcano normally suffers phases of eruptions with between 3 and 10 eruptions during a few decades short span before going dormant for a few decades. Bárðarbunga is likely to erupt in the next 1 to 7 years. The remnant pluton that forms the Eldey island. Wikimedia Commons, photograph by Dagur Brynjólfsson. 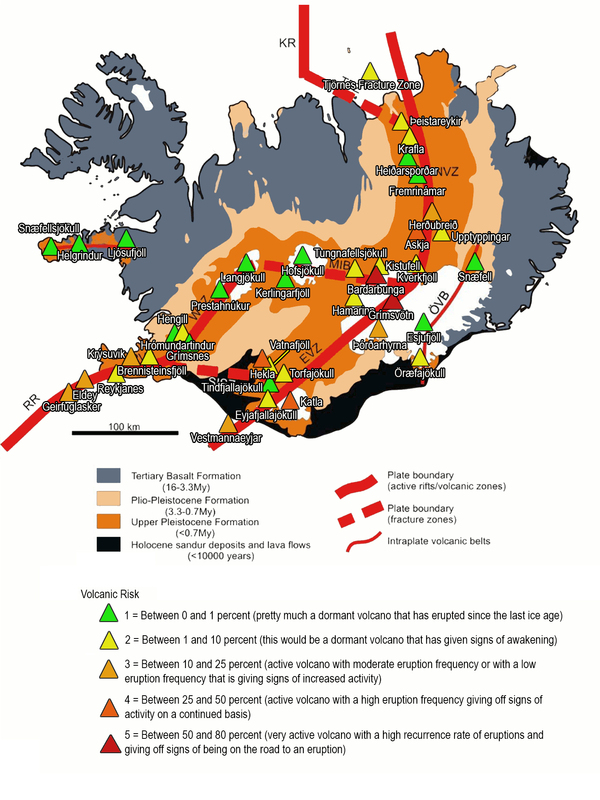 Eldey and Geirfuglasker are two NW-trending fissure swarm volcanoes that forms a larger double system that is separated in behavior from the Reykjanes volcanism and the Reykjaneshryggur volcanism. What sets them apart is that they are the intersection between the Reykjaneshryggur part of the Mid Atlantic Ridge (MAR) and the Reykjanes Volcanic Belt (RVB). As such they are not true MAR-volcanoes, and not true Icelandic volcanoes either, but instead form an intermediary type of volcanism. These two volcanoes have had six known historical eruptions with four of them forming ephemeral islands. It is likely that there have been further eruptions, but that these have been too small to be noticed. The last eruption occurred in 1926 and did not produce an island. There are no central volcanoes associated with them; instead they form two short volcanic fissures with shallow elongated flat topped subaqueous banks. The eruptions are predominantly of the Surtseyan type. These two volcanoes are intensely seismically active with frequent intense earthquake swarms. At least Eldey has a high temperature thermal field. Esjufjöll is a little studied central volcano with no known fissure swarm that is situated under the eastern part of Vatnajökull on the Öræfajökull-Snæfell Volcanic Belt (ÖVB). This volcanic belt consists of 3 volcanoes that are remnants of a previous tectonic rift that was supplanted by the Eastern Volcano Zone (EVZ). The other two volcanoes on this volcanic belt are Öræfajökull and Snæfell. The only known Holocene activity at Esjufjöll is a small (VEI-1) eruption or phreatic detonation that occurred in 1927. The volcano has suffered small scale infrequent earthquake-swarms in the last decade, but the level of activity and almost non-existent eruption history makes it fairly improbable that it will erupt in the foreseeable future. Fímmvörduhals strombolian eruption prior to the plinian eruption of Eyjafjallajökull. Wikimedia Commons, photograph by Boaworm. Few volcanoes are as famous as this easy to pronounce volcano in Iceland. It is situated where the Eastern Volcanic Zone transforms into the Vestmannaeyjar Volcanic Belt under a small glacier. It is the only known Icelandic central volcano that lacks a regular magma reservoir; instead it has a system of sills and dykes that contains the stored magma. Eyjafjallajökull has had five known eruptions in the last 2000 years, but there have probably been more of them. Prior to the famous 2010 plinian eruption it suffered two major earthquake swarms indicating intrusions. The intrusion-indicating swarms was spaced by more than a decade, so it is likely that any further eruptions will be preceded by earthquake swarms years to decades prior to onset of eruption. After the eruption the volcano has had low level seismic activity associated with magma shrinkage due to cooling in the system. The Fremrinámar volcanic system is situated between Askja and the Heiðarsporðar volcanic system on the Northern Volcanic Zone. It consists of an inconspicuous central volcano and a 130 kilometer long fissure swarm that reaches the northern coast of Iceland. The volcano is mainly effusive and has had 2 eruptive episodes in the Holocene. The first directly after de-glaciation and the second was 5000 to 3000 years ago. This volcano is almost totally seismically inactive and has shown no signs in recorded history of waking up from its dormancy. Grimsnes volcanic system. Wikimedia Commons, photograph by Progresschrome. This is one of the two smallest volcanic systems in Iceland; it may have had a small eruption in the early Holocene. It has no central volcano and consists of a 12 kilometer long fissure swarm. It is situated east of the intersection between the Reykjanes Volcanic Belt, the Western Volcanic Zone and the Southern Icelandic Seismic Zone that is situated at the Hengill volcanic system. No known seismic activity is recorded and no other signs of activity have been recorded. The volcano may now be on the brink of ceasing to be a volcano. Part of the midle of the 3 Grimsvötn calderas showing the Nunatak where the IMO Seismometer GRF is situated. Wikimedia Commons, photograph by Roger McLassus in 1972. The massive Grímsvötn volcanic system is one of at least two known central volcanoes on the 120 kilometer long Grímsvötn volcanic fissure swarm. It is located towards the middle of the Vatnajökull Glacier and is a part of the Eastern Volcanic Zone. The central volcano is a complex volcano that is part shield volcano, part tuya and part stratovolcano. It has a triple-caldera that was formed during the explosive Saksunarvátn eruptive suite. The volcano has produced the largest explosive eruptions in Iceland. The volcano is also the most prolific erupter in Iceland with an average time between eruptions of only 7 years. During heightened activity it erupts about every 3 years. The fissure swarm is home to some of the largest basalt floods on Iceland with at least four known. The largest known is the second Lakí eruption (the Skaftár Fires) that produced 15 cubic kilometers. The volcano produces medium sized seismic activity between eruptions and continuous uplift as magma seemingly freely enters the upper magmatic reservoir. It is highly likely that the volcano will erupt within the next 1 to 5 years. The Hamarinn central volcano is situated on the Veidivötn fissure swarm SSW of Bárðarbunga. This volcano has been little studied and there is no known eruption in the Holocene emanating from this volcano. It is from time to time highly seismically active and it has shown the largest GPS-signal changes in Iceland, both as inflation and deflation without having had an eruption. As such it is one of the most active volcanic systems in Iceland. It has mechanical links ranging towards the southeast Þórðarhyrna, evidenced by seismic activity travelling between these central volcanoes. Another mechanical connection goes between Hamarinn and Grímsvötn central volcano. 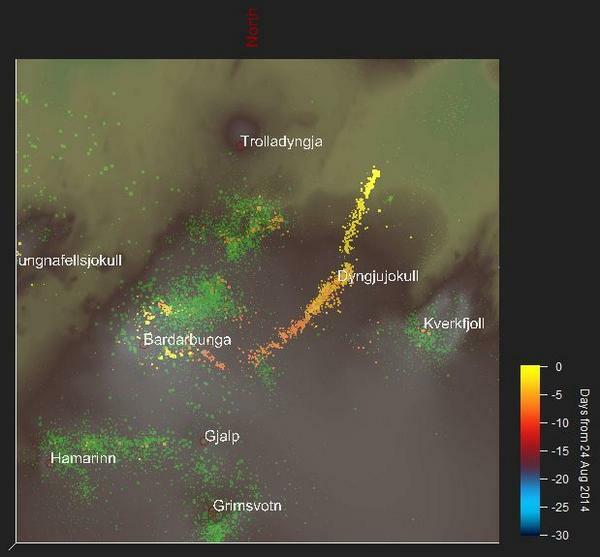 During the eruption of Bárðarbunga there was seismic activity in between the two central volcanoes implying a third mechanical connection. The level of activity implies that this volcano may erupt in the future. This little studied volcanic system contains one central volcano and a fissure swarms that overlaps the southern Krafla fissure swarm and parts of the northern Fremrinámar fissure swarm with a total length of 30 kilometers. Heiðarsporðar has had two eruptive episodes spaced by a time period of 8000 years. All eruptions have been medium sized during the Holocene with an effused volume above 1 cubic kilometer per eruption. There is though evidence that the volcano has produced large scale basalt floods prior to Holocene. Heiðarsporðar has little or no seismic activity and has shown no recorded signs of volcanic activity. Rare image view of Hekla taken from SSW. In the foreground is the lava flood from the 1947 eruption. Wikimedia Commons, photograph by David Karnå. Hekla is Iceland’s youngest volcanic system and consists of a central volcano and a 60 kilometer long volcanic fissure swarm. The volcano is about 7800 years old. Hekla is a class of volcanoes on its own with no known counterpart in the world. It is situated on the intersection between the Eastern Volcanic Zone and the Southern Icelandic Seismic Zone. To the northeast you have Torfajökull volcanic system and to the southeast you have the Vatnafjöll volcanic system. Hekla is a volcanic fissure (Heklugjá) that is rapidly transforming into a stratovolcano. It is famous for its bimodal eruption where the first phase is extremely explosive and the second phase is effusive. Hekla is famous for having the shortest recorded run up time from first signs of an impending eruption to the onset of eruption. Normally it takes between 32 to 120 minutes between the first earthquake and the start of a full on highly explosive eruption. Prior to the 1104AD eruption the volcano erupted infrequently, but after 1104 the eruption frequency has steadily increased over time. At the same time the nearby volcanic system of Vatnafjöll has gone dormant. The volcano has a world record. It has hurled a lava bomb 42 kilometers killing a farmer out in his field. There are currently no signs of an upcoming eruption, but then on the other hand there never are. The Hengill volcanic system contains one composite shield volcano that can be viewed as a hyaloclastite massif. It is situated on a 60 kilometers long fissure swarm that extends in under Lake Thingvallavatn. The volcanic system is one of 3 known triple junction volcanoes on Iceland; the other two are Bárðarbunga and Þeistareykir. To the west it connects to the Reykjanes Volcanic Belt, to the northeast to the Western Volcanic Zone and to the east it connects to the Southern Icelandic Seismic Zone. It has produced 9 eruptions ranging between 1 and 5 cubic kilometers during the Holocene. It is moderately seismically active but is currently not showing any signs of nearing an eruption. The Helgrindur volcanic system consists of a central volcano and a 30 kilometers long fissure swarm named Lýsuskarð. It is situated between Ljósufjöll to the east and Snæfellsjökull to the west on the Snæfellsness Volcanic Zone. The volcano has had two small basaltic flow eruptions in the last 10 000 years. It is one of only two volcanoes in Iceland that is not continuously monitored. Herdubreid may be the most perfectly shaped and dramatic volcano on the planet. If it erupts it would be at least partially destroyed. Photograph by Thrainn Vigfusson. Herðubreið is a central volcano situated east of Askja, North of Upptyppingar and south of Fremrinámar. It has no known fissure swarm, or it might share a fissure swarm with Upptyppingar. It is situated on the Northern Volcanic Zone. Except for a minute tuff cone formed on top of this perfectly formed Tuya that erupted during deglaciation, no other Holocene eruptions are known. A decade ago a seismic crisis started at Upptyppingar as a large intrusion of fresh magma from depth occurred. After intense seismic activity the intrusion stopped migrating upwards at Upptyppingar and instead formed a north going slowly forming dyke that moved towards Herðubreið where it stopped. Since the magma filled dyke came to Herðubreið there has been moderate to intense seismic activity under the volcano and an independent feeding system from depth has formed. Currently Herðubreið has 1 to 2 earthquake swarms per year and not counting these swarms it has about 1000 earthquakes per year making the volcano the second most seismically active in Iceland after Bárðarbunga. The Hofsjökull – Kerlingarfjöll volcanic system comprises two evolved central volcanoes. The Hofsjökull volcanic caldera is 30 square kilometers large and the other central volcano is the dormant to extinct Kerlingarfjöll central volcano. The volcanic fissure swarm is 90 kilometers long and 35 kilometers wide and is situated along the Mid Icelandic Belt. All Holocene eruptions have come out of the Hofsjökull central volcano and have generated small basalt flows and no known tephra fields. The volcanic system is showing very little seismic activity today. The Hrómundartindur volcanic system may be Iceland’s smallest volcano. It consists of a minute central volcano and a 25 kilometer long fissure swarm. It had one minor eruption about 11 000 years ago. It is due east of Hengill and is situated to the north with the Northern Volcanic Zone and to the Southeast to the Southern Icelandic Seismic Zone. Hrómundartindur is highly seismically active and prone to intrusive periods. 3 periods of root-filling intrusions are known during the last century; the last of those started in 1994 and ended in 1998. The long running seismic crisis consisted of more than 90 000 small earthquakes. At the same time there was 10cm of uplift and increase of geothermal activity. The volcano is also highly active in regards of geothermal activity and it contains a large geothermal field. The Myrdalsjökull glacier, behind the glacial wall is Katla. Wikimedia Commons, photograph by Chris73. The Katla volcanic system is one of the 3 largest in Iceland and the central volcano has the on average largest explosive eruptions ranging from VEI-3 to VEI-6. The volcanic fissure is 80 kilometers long and is named Eldgjá and produced an 18 cubic kilometer basalt flood in 934AD. The central volcano is covered by the Myrdalsjökull glacier and contains an 88 square kilometer caldera. The caldera floor is intensely active with geothermal activity. The volcano is frequently suffering from earthquake swarms and is believed to be the home of a shallow magma reservoir at 2km depth. Episodes of uplift and deflation happen about once per decade and between earthquake swarms about 1000 earthquakes take place per year. During the last couple of years Katla has been less seismically active. The greatest risk with this volcano is its profusive jökulhlaups (glacial floods) that can be as big as the Mississippi, Amazon and the Nile put together. In the aftermath after the 1918 VEI-5 eruption the Jökulhlaup was the largest river on the planet in the last 10 000 years. Prior to 2013 it was not known that Kistufell was the third central volcano on the Veiðivötn fissure swarm (Bárðarbunga). In 2013 a low level earthquake swarm started at 22 kilometers depth that moved into a fully formed magma reservoir. Prior to this the volcano was deemed to be dormant to extinct. In the end the magma did not manage to break through the roof of the magma reservoir, instead it formed an SSW trending dyke that breached all the way into the Bárðarbunga magma reservoir. As such it was the first witnessed example of one central volcano feeding another. This makes Kistufell into the prima causa of the 2014 Holuhraun eruption. Prior to 2013 Kistufell was not seismically active, but after the 2014 eruption it is suffering from between 1 and 10 earthquakes per week. Kistufell did not deflate during the Holuhraun eruption; instead it seems to still be inflating at a low rate of uplift. Geothermal activity at Krafla. Wikimedia Commons, photograph by Nicolamquin. The Krafla volcanic system is situated on the Northern Volcanic Zone between Heiðarsporðar to the south and Þeistareykir to the north. The volcano consists of an 80 kilometers long and 15 kilometers wide fissure swarm and a nested caldera. It has a shallow magma reservoir situated under the central shield volcano at 3 to 7 kilometers depth. It is geothermaly active. Eruptions are divided into 3 cycles of eruptions and the last one started 2 800 years ago. Current frequency of these rift eruptions are about 500 years. The rift eruptions consist of several eruptions and may last decades. Krafla is currently mildly tectonically active and is showing no signs of an upcoming eruption, but that may change. Krýsuvik geothermal field. Wikimedia Commons, photograph by Reykholt. The Krýsuvik volcanic system consists of a 50 kilometer long composite fissure swarm and has no central volcano. It is situated between the Reykjanes-Svartsengi volcanic system to the west and the Brennisteinsfjöll volcano to the east on the Reykjanes Volcanic Belt (RVB). The volcano has been mildly active in the Holocene with 11 recorded eruptions, the last eruption occurred in 1340. The eruptions are generally small in size, 0.1 to 1.0 cubic kilometers and may produce mild tephra outfall. The volcanic system goes in under Lake Kleifarvatn to the east and if an eruption would occur there it would become explosive. Krýsuvik has been seismically active and increased in its activity in 2008 when an episode of magmatic influx and inflation started. The episode ended in 2011 when subsidence stated, the seismic activity continued during the subsidence. The volcano contains an area of high geothermal activity. The Kverkfjöll volcanic system is little to moderately active volcano situated at the northern edge of the Vatnajökull glacier. It is due east of Kistufell and south of Upptyppingar. It contains a 130 kilometers long fissure swarm and a central volcano with two 9km wide ice filled calderas. Kverkfjöll is one of two central volcanoes on the fissure swarm, the other is Upptyppingar. The volcano last erupted in 1968 in a small phreatomagmatic eruption. After that it has had at least one phreatic detonation (2013) and is highly geothermaly active. It has low to moderate seismic activity. An eruption would most likely be phreatomagmatic and phreatic explosions may occur at any time. Kverkfjöll is a prolific producer of small to medium sized Jökulhlaups. Hveravellir Geothermal Field. Wikimedia Commons, photograph by Andreas Tille. The Oddnýjarhnjúkur-Langjökull volcanic system is situated on the Western Volcanic Zone with Préstahnjúkur volcano to the south and Hofsjökull to the east. It is situated on the northern end of the Western Volcanic Zone and the western end of the Mid Icelandic Belt and is probably a remnant of a failed triple-junction. It contains a central volcano and a 100 kilometer long fissure swarm. It also contains the famous Hveravellir geothermal area. The Holocene eruptions have been ranging from small (0.1 cubic kilometers) to large effusive eruptions (13 cubic kilometers). It last erupted in 950AD and its activity has been steadily dwindling over Holocene following the slow deactivation of the Western Volcanic Zone. The seismic activity is low and changes to the geothermal system have been mild over time. The Ljósufjöll volcanic system is the most active on the distal Snaefell Volcanic Belt. It is situated on the eastern end of the volcanic belt. It has had numerous small effusive basaltic lava flows and the last eruption occurred 960AD. The central volcano was built up by rhyolitic eruption, but no rhyolitic eruption has occurred during the Holocene. Kolbeinsey island, it will probably be completely gone before 2020. Wikimedia Commons, photograph by Sindre Skrede. There are at least 3 known volcanic systems extending northwards from Iceland on a continuation from the Northern Volcanic Zone. These volcanic systems are all subaqueous and may form ephemeral islands during eruption. One is situated north of Þeistareykir and may be a second central volcano on the Þeistareykir fissure swarm. The next is due east of Grimsöy and the third is next to the disappearing island of Kolbeinsey. The last known eruption occurred in 1867 to 1868 near Manaeyjar. The area is intensely seismically active and it is not well known what the precursors to an eruption might be. The volcano is situated in the middle of the Western Volcanic Zone with Langjökull to the north and Hengill to the south. It consists of a 90 kilometer long basalt erupting fissure swarm and a central rhyolite erupting caldera volcano. During Holocene Prestahnúkur has been moderately active with medium sized flood basalts (5 cubic kilometers). No rhyolite has been erupted during Holocene. Prestahnúkur has low seismic activity and has shown no signs of activity in the last couple of decades. The Reykjanes and Svartsengi volcanic systems consist of two short fissure swarms. The Reykjanes fissure swarm is 45 kilometers long and starts 9 kilometers out into the ocean and runs up to the 30 km long Svartsengi fissure swarm. Reykjanes volcanic system is situated at the tip of the Reykjanes Peninsula and Svartsengi is directly east of Reykjanes. Reykjanes is situated between the Eldey Volcanic Belt and the Reykjanes Volcanic Belt and Svartsengi is on the Reykjanes Volcanic Belt. Both systems are syneruptive and tend to be active at the same time, last evidenced in the Reykjanes Fires (series of fissure eruptions) that ended for both volcanic systems in 1240AD. Neither of the volcanic systems has a central volcano. Both systems are seismically active, Reykjanes a bit more so than Svartsengi. Svartsengi has an extensive geothermal area with occasional hydrothermal explosions at geothermal wells. There is currently no evidence of activity associated with the possibility for an eruption. The Snæfell volcanic system is situated on the Snæfell – Öraefajökull Volcanic Belt (ÖVB) and sits on the northern end of that belt. It has not erupted during the Holocene, but the volcano is known for long repose times between mainly rhyolite eruptions, or eruptions with other highly evolved lavas. Short volcanic fissures emanate from the central volcano. The volcano is showing very little seismic activity and no other activity is known pointing towards an eruption. Snaefellsjökull in the morning. Wikimedia Commons. The Snæfellsjökull volcanic system should not be confused with the Snæfell volcanic system in the east of Iceland. Snæfellsjökull is the westernmost of Iceland’s volcanoes and it was made famous by Jules Verne as the point where his hero went down into the planet on his journey to the middle of the earth. It is situated due west of Helgrindur volcano on the Snæfellsness Volcanic Zone. It is the second of Iceland‘s unmonitored volcanoes. It consists of a central volcano and a short fissure swarm. It has an eruption frequency of about one eruption per 400 years and the eruptions are small basaltic flows. The last eruption was in 200AD, it is believed that summit eruptions may cause jökulhlaups. No activity pattern is known for the volcano and it is also unmonitored making it fairly impossible to know what the state of the volcano is. No large earthquakes have been registered at the volcano for the distal seismometers to pick up. A brief seismological campaign did though pick up small earthquakes (less than M1). The Tindfjallajökull volcano from the air. Wikimedia Commons, photograph by Martin Barth. The Tindfjallajökull volcanic system consists of a central volcano covered by a small glacier. It has no known fissure swarm. It is situated on the Eastern Volcanic Zone with Eyjafjallajökull to the south, Vatnafjöll to the west and Torfajökull to the north. It was mildly active in the early Holocene with small basalt lava flows and extrusion of a rhyolite dome. No activity has taken place in the last 8000 years. Very little seismic activity occurs at the volcano, typically with less than 10 earthquakes per year. No other signs exists of volcanic activity is evidenced. Torfajökull volcano. Wikimedia Commons, photograph by Chmee2. The Torfajökull volcanic system is situated on the Eastern Volcanic Zone north of Tindfjallajökull, northeast of Hekla and southwest of Hamarinn. It consists of a rhyolite central volcano with a basalt fissure swarm. Eruptions from the resurging caldera are mainly explosive, with the fissure swarm being effusive. The volcano last erupted in 1477AD during the Veidivötn eruption. Parts of the volcano are showing signs of inflation, especially during eruptions at Hekla. There is no link to Hekla other than the inflation during eruptions. Another part of the caldera is constantly deflating, associated with cooling magma that is shrinking. The volcano is moderately seismically active and has the largest geothermal area in Iceland. Sometimes small volcanic features have a lot of names. Tungnafellsjökull is technically the name of the glacier and not the volcanic features it contains, but even the Icelanders use it in a volcanic context. Tungnafellsjökull is a small glacier situated on the Mid Icelandic Belt between Hofsjökull and Bárðarbunga. If we break up this volcanic system and start with the fissure swarm it is 55 kilometers long and 15 kilometers wide and is named Vonarskarð Fissure Swarm. Under the glacier we find a northern larger caldera named Tungnafell and a southerly horseshoe-shaped caldera named Vonarskarð and on the southern part of the fissure swarm we find the Hágöngur central volcano. The volcanic system has been active during the first half of Holocene with at least two small eruptions. Normally the system is mildly seismically active, but prior to, during and after the 2014 Holuhraun eruption seismicity has been greatly increased. There have also been GPS-trajectory changes that might imply a small intrusion directly under the Vonarskarð caldera. The young Vatnafjöll volcanic system is often erroneously lumped together with Hekla in older literature. It is though apparent that it is a volcanic system of its own. Among other things the lavas erupted is highly different from the lavas erupted at Hekla. Vatnafjöll is southeast of Hekla and northwest of Tindfjallajökull and is situated on the Eastern Volcanic Belt. The volcano consists of a central fissure volcano (Vatnafjöll) and a 40 kilometer long fissure swarm. Vatnafjöll has been highly active during Holocene with medium to large-sized basalt eruptions and basalt floods ranging between 1 and 12 cubic kilometers in size. The last eruption is believed to have been around the time of settlement in Iceland. The volcano has between 50 and 250 earthquakes per year and suffers from intermittent medium-sized earthquake swarms. It also has larger tectonic earthquakes ranging up to M6 on the moment magnitude scale. Activity at Vatnafjöll diminished as the activity at Hekla increased. The early Holocene or late pliocene island of Elliðaey. Wikimedia Commons, photograph by Diego Delso. The Vestmannaeyjar Volcanic Belt is a formative fault and volcanic zone that is believed to be taking over as the landfall point of the Mid Atlantic Rift in the future. If that happens the Southern Icelandic Seismic Zone and the Reykjanes Volcanic Belt will go into dormancy or inactivation, probably also making the Western Volcanic Zone inactive together with the Mid Icelandic Belt. The Vestmannaeyjar Volcanic Belt is formed by short volcanic fissures situated over a 100 meter high elevated and elongated bank stretching from beyond Surtsey all the way to the north of Heimaey. There are about 30 known eruptions during Holocene with 6 of them taking place at the formative Heimaey central volcano. The other eruptions have formed ephemeral or stationary islands with the last island formation taking place at Surtsey between 1963 and 1967. The last eruption was in 1973 with the Eldfell eruption of the Heimaey central volcano. Eruption frequency in total is roughly one every 100 years with most of those being small subaqueous eruptions that would only be noticeable as disturbances on the surface, or on seismic instruments. About once every 250 to 500 years there would be an island forming eruption and once every 1000 years an eruption on Heimaey. There are between 10 and 50 seismic events at Vestmannaeyjar volcanic system each year, normally at Surtsey or Heimaey. No current activity points towards an upcoming eruption, but historical records state that seismic activity is only noticeable immediately prior to eruption. The aptly named Upptyppingar central volcano is an under-studied central volcano on the Kverkfjöll fissure swarm. It is known to have a fully formed feeding system from depth and is believed to have erupted in the early Holocene. It is situated north of Kverkfjöll and SSE of Herðubreið on the Northern Volcanic Zone. During an intense seismic crisis where the volcano was believed to be close to eruption the name was transliterated into Mount Viagra by CNN, in reality the name is far more filled with Icelandic humor. The seismic crisis ended up diverting from Upptyppingar and has over the last few years moved in under the Herðubreið volcano. Upptyppingar is moderately seismically active, but may at any time suffer from an earthquake swarm associated with further magmatic intrusions. If it ever erupts it may become the first volcanic eruption that is censured by main stream media for semantic reasons. The Þeistareykir volcanic system is the northernmost onland volcano at the Northern Volcanic Zone, to the south you find Krafla and to the north the Tjörnes Fracture Zone. Þeistareykir is one of Iceland’s 3 known triple-junction volcanoes with the third associated fault being the Husavik – Flatöy Fault. Þeistareykir is unusual since it is Iceland’s only central volcano lacking an edifice. During Holocene the eruptions have all started as rifting fissure eruptions. Usually the eruptions starts as medium to large flood basalts ranging from 1 to 20 cubic kilometers and ends up with lava shield formations ranging from 5 to 30 cubic kilometers in volume. The central part consists of silicic rocks erupted during the last glacial and Þeistareykir has a fissure swarm that is 80 kilometers long and reaches out into the sea. The volcano has repose times that last for thousands of years with the last eruption occurring 2400 years ago. The volcano is seismically active with 50 to 250 earthquakes per year with few or no earthquake swarms. It is though the only Icelandic volcano that can produce earthquakes with a magnitude of 7 on the moment-magnitude scale. These earthquakes produce large scarp faults. From 2008 there has been an upturn in the amount of motion on the faultlines and intermittent inflation. Þeistareykir is the only Icelandic volcano that is believed to incorporate earthquakes up to M7 prior to an eruption. The volcano is also geothermaly active indicating shallow magma. Þórðarhyrna is the second central volcano on the Grimsvötn fissure swarm. At Þórðarhyrna the fissure swarm divides into two separate lobes, the western Lakí fissure swarm and the eastern Rauðhólar fissure swarm, both of them are able to produce large flood basalts. The volcano is situated south of Grimsvötn on the Eastern Volcanic Zone. Þórðarhyrna erupts every 100 to 250 years and normally has slightly larger eruptions compared to its more active northern counterpart. The last eruption was a VEI-4 eruption in 1903. The volcano is mildly seismically active with less than 50 earthquakes per year, but in the last year the activity has increased with about 250 to 500 seismic events per year indicating that the volcano may be nearing another eruption in the upcoming decade. The tallest peak of Öraefajökull is Hvánnadalshnúkur. Wikimedia Commons, photograph by Kristinnstef. The Öræfajökull central volcano lies on the Öræfajökull – Snæfell Volcanic Belt with Öræfajökull being the southmost and most active volcano on the belt. It is the only volcano in Iceland that is expressing explosive silicic eruptions only. It is also the tallest volcano in Iceland being 2 110 meters high above sea level. The volcano has a small caldera on the top (3 by 4 kilometers wide) and during eruptions it produces 0.1 to 10 cubic kilometers of tephra. Average eruption rate is about one eruption per every 500 years. Öræfajökull is normally not particularly seismically active so the increase in seismic activity in the last few months may indicate reactivation or intrusion of fresh magma. This may though not indicate that the volcano is nearing an eruption and might instead be a signal of seismic unrest caused by deglaciation causing anthropogenic isostatic rebound. Some of you may have noticed that I have added two more volcanic belts. The Eldey – Geirfuglasker Volcanic Belt and the Vestmannaeyjar Volcanic Belt that is not normally mentioned in the literature. The reason I think that it is warranted is that the areas express volcanism that is sufficiently different to separate them from the mainstream volcanic belts and zones. Traditionally the Eldey – Geirfuglasker volcanic systems are counted as either part of the Reykjanes Volcanic Belt or the Reykjaneshryggur part of the Mid Atlantic Rift, but the eruption styles and frequency is so different that it warrants to be set apart in my view. The Vestmannaeyjar volcanic system is traditionally seen as the southernmost part of the Eastern Volcanic Zone, but it is sufficiently different from a tectonic standpoint to differentiate it. After all, the Eastern Volcanic Zone is not a nascent new rift and the Vestmannaeyjar are. I am feeling quite confident that in the future science will incorporate these different naming practices, after all they mirror reality. This is a marvelous piece of work which builds on years of experience. Wow. Thank you Albert, and also thank you for the help with correction the math behind the risk levels. Awesome and informative article. Thanks for this, and the chuckle as well, Carl. If “Iceland” and “easy to pronounce” in the same sentence isn’t THE classic example of an oxymoron – nothing is! I actually find Icelandic pretty easy, but then our languages are related. The ironic bit, is that English shares the same roots, and we have great difficulty with it. There are even several fundemental words in English that come directly from old Norse that blow us away when written in the original spelling. Appropriately, the coffee I spewed was Sumatran. Such a wonderful looking quake orientation here. There has to be a fissure line that runs directly from Öræfajökull, through Grimsvton, Bardarbunga, and possibly ending at Tungnafellsjokull. Given, this isn’t proof of anything really, but I keep seeing this pattern on the Iceland quake map over the last year or so. There might be an old short fault there, but I do not think that there is anything more. At least until we see more evidence. Remember that we have seen very few earthquakes on that “line” until now. And there we had some sort of evidence that there is a fracture zone or some such there. 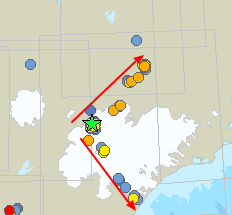 It is even showing the same banded behavior that the Southern Icelandic Seismic Zone does. Did not expect that. Sure, I will give it a shot. I did the map above really quick and the quake/map alignment is not very good, the IMO map has some projection or rotation, you can see the Öraefajökull swarm is due west of where it should be. I wish there was a more central GPS able to show uplift of the actual caldera. I can’t see any particular feeder tube forming, instead it seems like the entire mountain is moving. I guess this points towards the anthropogenic isostatic rebound being the most likely culprit. Wonder how it would look with 2016 only? I took a look and not too much difference if you look at only the recent ones. They are still scattered. We know all about rebound here in Southern Ontario Canada, we are still on the rise from the Ice Age, about 30cm per 100 years. Also, What a great read on this post! People who are not from the North does not understand how massive Isostatic rebound can be. Where I come from we have 89cm per 100 years and I studied at around the place with the world record rebound 112cm per 100 years. Note that the alignment of this fracture zone is perpendicular to the large rifts in the dead zone. Could you assume that any rift activity in the dead zone would cause a slip along this fracture zone, acting as sort of a termination of the rifting movement? If there is a rift running this way it would not be the first such in the region. Remember Gjálp, Hamarinn – Bardarbunga, Bardarbunga – Loki, Thordharhyrna – Hamarinn and so on. Just look at how the MAR behaves, there is a lot of perpendicular rifts to the main one. If this one exists I am certain that it is purely tectonic in nature. That’s what I mean – a purely tectonic slip. The idea is that when a rift such as Laki opens up, a corresponding movement occurs as a slip along the line running from Tugnafellsjökull to Öraefajökull, effectively terminating the dyke so it does not extend further under Vatnajökull. I would be careful stating that it terminates the rift propagation. We simply just do not know how long and where it would terminate in an eruption. At the least Laki was syneruptive with both Thordharhyrna and Grimsvötn. If true it would though make Grimsvötn into a triple-junction volcano. This may be the only advantage of the upcoming vanishing of the glacier. We would be able to see all of the structures that are hidden under all of that ice. It seems that the first part was already a formed dyke, probably still there from the first Holuhraun eruption. That explains the silent outbreak throught the wall. But I’ve got to admit, one never knows about the quirks of Hekla and other sudden intrusions..
Herdubreid: Will the dyke make it to the top by its own or does the intrusion need some more fresh magma to make the last few km? How is it possible that a dyke from another volcano transforms into an own feeder system down into the mantle? Magma should be rising due to the difference in temperature and density and not go down/build/reactivate a feedersystem? My guess is that the dyke caused sufficient tectonic stress to cause rifting moving downwards, there seems to be evidence for this in the earthquake locationing. Wonderful, informative post, Carl. Thanks for sharing your expertise and your hard work in this way. I am doubtful about that report. I think it was at most a small phreatic detonation, but most likely it was a small jökulhlaup that showed up as tremor. It has not been placed on the canonical eruption list by either IMO or the Icelandic University. Good reason for treating the report sceptically, then. Thanks. When in doubt, be conservative with these things. Note that the purported 2011 Katla micro-eruption did not end up on the canonical list either, nor did 2013 Kverkfjöll. A magnificent summary, and thank you Carl. Your spellchecker must have been running hot in that one. You have created a great summary of Iceland and I’ll be referring to this a great deal. Thanks!! Awesome read, thank you very much Carl! Can we still expect a follow up on Grimsvotn part 1, once you’ve recuperated from your effort on this article? There will be more about Icelandic volcanism as and if anything interesting happens. But for the near future I will deviate away from Iceland I think here on the blog. On the other hand, this was kind of a dry run and a way to collect my thoughts as I embark on what I think of as the definite book on Icelandic volcanism. But that will take a bit of time to write. I hope that it will be out in a year. Great. Will look forward to that. But unless something goes boom I will try to stay clear for a while. It works out pretty well to the expected 3-7 volcanic eruptions in the next decade. Remember that we are in both a magma cycle and entering the rifting fissure eruption cycle so Iceland is on a “high” right now. I was really swallowing this article! Thanks. Yes – but I *think* that the recent M4+ didn’t. Or did it? * Doubling of the g-consonant and in Old English the g-consonant was palatalised to cg. In Old English the proto-Germanic Hrugjaz became Hrycg (Modern English Ridge) and in Dutch it became Rug. Question for Lurking, or anyone else who may know: There is a general formula out there that is used to estimate past eruption sized based on the size of a caldera. Does anybody have access to a paper around this or where the formula originated from? I can’t seem to find it anywhere. I kind of want to do some writing challenging it, but obviously need to look into it a bit deeper first. Lazyhand minimum version is quite simple. W*L*D*0.7=X This gives the caldera formation loss without any edifice. So it is highly conservative. Even though it is dead simple it gives as good an estimate as any other more complex formula that I have seen. Y=Rock edifice volume removed explosively (if an explosive caldera formation) or as additional volume if it is a collapse caldera formed via subsidence. Notice that an equal edifice caldera erupted a larger volume of lava than the explosive formation. How did they arrive at the numbers in these formulas? I guess the point I wanted to put forward in what I would be writing about would be that historically, the formula that estimates eruptive volumes based on caldera size is conservative to the point of being silly, and noticeably innacurate. But before making a few arguments. I want to better understand how this estimation was arrived at. CBUS, tephra volume will always be larger than the caldera cavity. Remember that you have to convert to DRE since the cavity for natural reasons are DRE. The numbers in my formulas use sleight of mathematics shorts for calculating circles and halfdomes. I substitute formulations for “good enough” easy to calculate with numbers. You will be a minute percentage off, but not so much that it has any real effect. If you use that on for instance Aniakchak you get into an 84km3 DRE caldera drainage and a 41km3 edifice removal. So, 84km3 magma loss (into tephra) and 41km3 volcanoclastic material. And that make it into a VEI-7 on the scale of Tambora. If you look at the pure isopac data it gives the eruption at 70ish km3 DRE, but then isopacs that old are iffy at best. I prefer data deduced from removed content since it does not change a lot over time. I agree wholeheartedly, but so many estimations of past eruptions do not follow this line of thought. I mean… what would this say for Iceland? Askja (large caldera), Torfajokull, Kverkfjoll, Tungnafellsjokull, and some of the central Iceland volcanoes also have some large calderas that we know very little about, which are likely to also be one-shot calderas. The big boys like Katla have big piecemeal calderas that are likely a result of repetitive collapse events, so may not have been from quite as large eruptions as the caldera would indicate. But if these were big events as the caldera size would indicate, where is the tephra for these eruptions? I know there are some significant and very large tephra deposits found from Torfajokull, but the others seem to be completely unknown or unfound. Did Bardarbunga’s caldera event go peacefully? If it went violently, then where is the evidence from this? Swept away on top of now-extinct glaciers? Askja and Krafla has had subsidence caldera formations that have been sequential. So not one big one, that is why their calderas are nested. Grimsvötn had a series of large explosive caldera formations in the early Holocene and Bardarbunga is a sequential subsidence caldera. But, most of the calderas that are indeed explosive was formed prior to holocene so the ashes are long gone. In reality Iceland has had few explosive caldera formations. Saksunarvatn tephras, Vedde Ash and the Öraefajökull caldera formation. All the others are pre-holocene so no records exist. I’d go with Carl’s method. I had one that I had cobbled together, but it was in need of refinement, and while I was at it, I was gonna gather all the references together. Since then the drive the data was on died, and have had a small stroke and haven’t gotten around to working on it lately. I’m just happy to be getting some of the feeling back in my finger. It seems that sleep really helps as the brain rewires to deal with the sensory data. I’ve always heard that we only use 10% of our brain. I guess that other 90% are areas that are used as spare grey matter when needed. I do though remember that upon occation we got different results. Mine was based off of published tepha volume estimates tied to caldera dimensions, and was in effect. A regression. Yours was/is based off of physical dimensions with some rules if thumb applied. As you know, regressions can tend to wander off the farm if you don’t update them with new and better observations as they come along. Ehum, note that all of these GPS-stations stopped inflating in march, or even deflated minutely. KISA stopped mid-April, but two weeks is too short to establish a trend. I think you need at least two months. Is there any effect from seasonal growth and melt of the glacier? Glacial melt causes uplift, not cessation of uplift. So, it is a bit of an oddity. It is probably paired with another GPS oddity, the northern movement of a large part of Iceland detected around the stations at the EVZ and NVZ. And normally I say that 5 days is needed to get a trend as a minimum, so 2 weeks is by far good enough to see a trend. five days is enough to see a change. But in the plot you can see that you get reversals lasting a few weeks – a bit like breathing pulses. It takes longer to see whether a small change is such a temporary (pulse up or down), or part of a longer lasting trend. If the change is large, five days will be enough, I agree. I take the liberty to repost a link brought in at Jon Frimann’s by Gizmo that joins up with Ian F’s post with the note that around october last year Bardarbunga’s quakes has been starting to increase again. yes, did notice that as well. You would have to do the beachball yourself from the quake detail list. That volcano south of Grimsvotn a few kilometers, Þordarhynra, that is a concern, isn’t it. Any Icelandic volcano could be of concern Mike. Great article and very informative for us amateurs! Thanks. It does indeed show very well how the volcanism is changing in Iceland over time. In the Western Volcanic Zone the volcanoes will sooner or later become completely inactive. Same for the SNB volcanism. And in other Icelandic volcanology related news… We’ve just bought a new car and as UK readers will know, the dealer sends you a list of a dozen or so available registration number/letter combinations. I scanned the list and nothing caught my eye, but just as I was thinking of accepting the first on the list, I spotted one ending MKO. Aha, I thought, that’s the one! So, an Icelandic tremor gauge and seismometer at Mókollar (SE of Askja) now has a car registered in its honour, as does a wonderful spot I visited a few years ago just east of Hamarinn. Correction: just *west* of Hamarinn. A new reposted old article is now up about Mount Erebus!